Here we will discuss about radian is a constant angle. 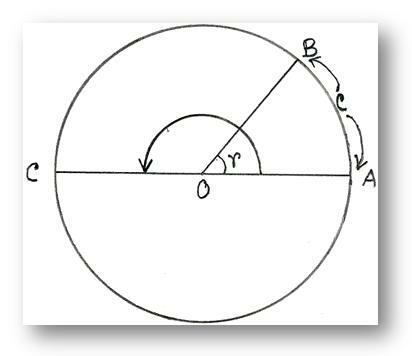 Let O be the centre of a circle and radius OR = r. If we take an arc AB = OA = r, then by definition, ∠AOB =1 radian. Let AO be produced to meet the circle at the point C. Then the length of the arc ABC half the circumference and ∠AOC, the angle at the centre subtended by this arc = a straight angle = two right angles. But in geometry, we can show that an arc of a circle is proportional to the angle it subtends at the centre of the circle. This is constant as both 2 right angles and π are constants.